If you're looking for an interesting, highly customizable interval timer for your Windows Phone, take a gander at Push It! Interval Timer. Push It! allows you to build custom work out timers or you can select one of three preset interval timers. Push It! is laid out nicely across the Windows Phone panorama design. Your first page list your programs (timers), then you'll find a page with the app's settings, and finally the About page. Settings cover the use of audible, animated and vibration warnings, how Push It! interacts with the Windows Phone lock screen, as well as options to launch the timer immediately and turn on/off background images. To create a custom program all you need to do is tap the + symbol on the Program Page and enter your times, sets, and intervals. 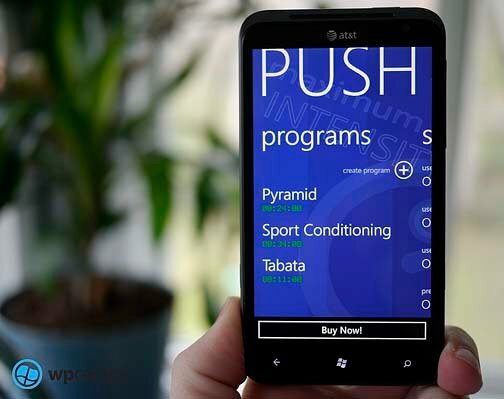 When you go to launch a program, you will see a summary page on the workout program with button controls to start, edit, copy and pin the program. The three dot menu pulls up the option to delete. Push It! is a nice looking, flexible timing app for your Windows Phone. I like the simple, straight forward interface that allows Push It! to fit your workout routines. I like having the ability to pin programs to your Start Screen. The only downside is that while the Tile will send you straight to the program, you can't back up to the app's main pages from the pinned program. All in all, Push It! Interval Timer ain't shabby. There is a free trial version available and the full version is running $1.29. You can grab it here at the Windows Phone Marketplace.